Affectionately known as "Barney" as it was recovered from a barn in South Australia after laying idle for many years. 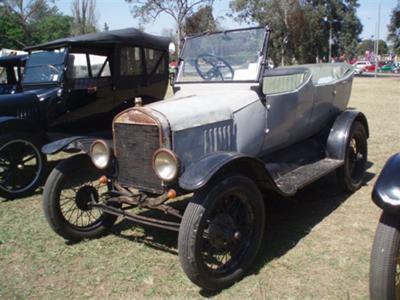 It has a South Australian made Duncan and Fraser tourer body with rear suicide doors. Originally a South Australian car it spent some of its life in Queensland before returning to South Australia and languishing in a barn for a number of years before I purchased it in 2009. Whilst significant mechanical refurbishment has been undertaken I have decided to leave the body as it is as the timber is quite sound and the panels rust free. It is complete with chaff bag seat covers, a farmers best efforts at panel beating repairs and has been painted at some time with a hand applied brush coat of battleship grey. At some time in its life it has had wire wheels (1926/7 style) added and is also running a shaft driven magneto.